This is Part 1 in a series called “To Switch or Not To Switch” about whether or not my gaming group should switch to Dungeons and Dragons, 5th Edition, or stay with Pathfinder. Just started my rpg group on a homebrewed quest in Andoran, part of the Pathfinder universe. I’ve put a lot of thinking into the story and it’s exciting to get the adventurers on their way. Everyone seemed to buy into the hook and the random encounters on their first travel day proved a good introduction to the content. 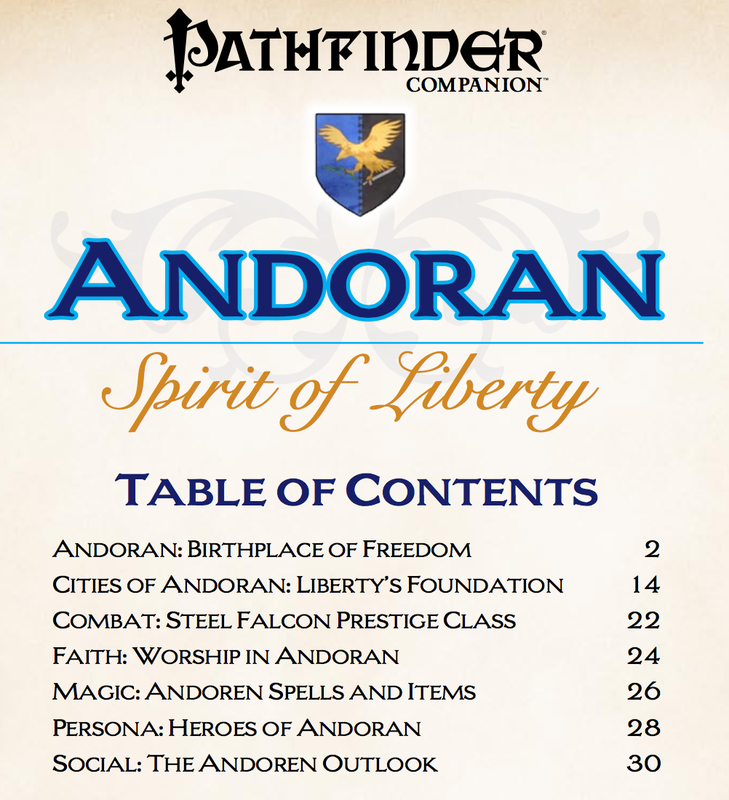 Should this campaign prove successful a good part of it will be thanks to the information in the Pathfinder Companion, Andoran, Spirit of Liberty. It’s 30 pages of information that really brings the continent to life. Whereas an adventure lays out the story for adventurers to play out, this is the reference material to fill in the details. I’ll supply the story, but this guide helps me make the world fit together a lot better than I can do on my own. Writing this campaign has made me realize just how difficult world-building is. If you try to blank-slate homebrew everything, you’ve got your work cut out for you. But I find after a few minutes of studying this source material I can usually come up with a few hooks and a plot that will make the next couple sessions a lot of fun. One of my concerns about switching from Pathfinder to Dungeons and Dragons 5th Edition (5e) is that I’ve only recently discovered how much better a DM I am with source material, but the two systems publish that material with wildly different formats. Paizo publishes a new Pathfinder Companion every month, and there are years of back companions I can work with. Each one isn’t all that expensive and it’s enough that I can homebrew campaigns. D&D 5e really doesn’t have this kind of material yet. A source book called Sword Coast Adventurer’s Guide is due out in November 2015, and it’ll be about $40. In addition to that, 5e does have a few Adventure Paths ready – long form campaigns that will take a party of characters from Level 1 through Level 15 with one huge story. That kind of Adventure Path might work well for us! I would do a lot less homebrewing and more module studying, and that’s how I got my start as dungeon master. Pathfinder offers this kind material as well – but once again they offer it not only as big books but also in monthly doses I can subscribe (and not subscribe) as I like. Both seem stable – but clearly Pathfinder has more room for options. 5e has fewer options, but may actually be what I need instead of help with world-building as I go. It’s a tough call. My heroes still have a ways to go in this quest, but once they reach the end I think we’ll have an epic enough moment our group can take a pause and decide whether we want to stick with Pathfinder or make the switch to 5e. I’ll make few more posts on my thoughts on the switch during that time. Reblogged this on Brews and Ewes.